Please Ensure This Part Fits For Your Motorcycle Before Bidding. please message us and give us a chance to assist you before you leave any feedback. We believe we can produce a positive outcome to any situation and will work hard to earn your praise. The good clip-on handlebar is an economical replacement handlebar with amazing strength.This clipon tubes are angled 10 degrees down to enhance rider control without sacrificing comfort.Now it is time for you to upgrade your vehicle. Condition:Brand new and High quality. Stainless steel fasteners and Delrin plastic ends. Easy to install, No Installation Instruction. Economical replacement handlebar with amazing strength. 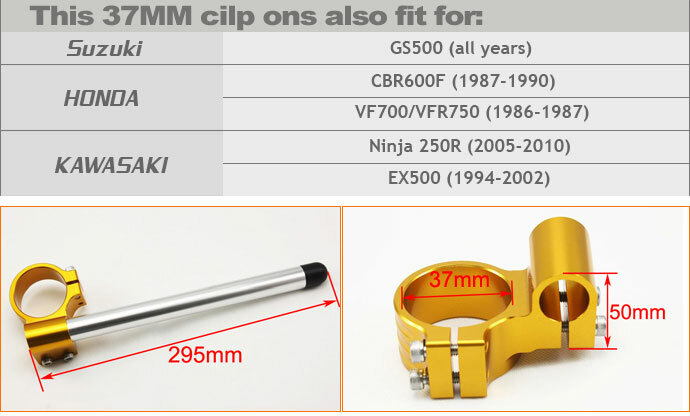 Clip-Ons have fork mounts that are machined from billet aluminum, with all unnecessary weight shaved away. Good Manipulating and stability at High speed. Ergonomic design minimizes fatigue and discomfort by creating the optimal riding position. In the event of a crash,simply replace the handlebar tube instead of the entire clip-on. Neverland Technology Inc dedicate d to provide high quality motorcycle parts, fairing and automobile parts with satisfactory customer service. We have served thousands of motorcyclists since 2010 and acquired great reputation worldwide. You can contact us by send a Email. If you have some complicated question or problem want contact , if you want inquiry some custom service and inquiry with picture please contact us by Email. powered by neverland-motor © Copyright 2019.